Sound bars are great to improve the sound quality on a TV in a tight space, but you’ll never get the same kind of immersive audio experience out of a sound bar that you’ll get from a real surround sound system. The problem is that most people think that going for surround sound instead of a sound bar means spending more money. Well that’s not true at all — you can get a fantastic surround sound for even less than you’d spend on a sound bar. 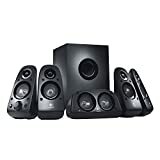 Check out the Logitech Z506 Surround Sound Home Theater Speaker System, which is currently on sale at a deep discount on Amazon for the refurbished model. 75 watts (RMS) of balanced power and room-filling sound. On-speaker bass control lets you easily dial the bass level up or down.